In 2015, the Globe-athon’s ambitions reached new heights with “Globe-athon in the Caribbean,” a multi-event series focused on raising awareness about below-the-belt cancers in some of the most underserved countries in the world. The series kicked off with a high-energy interfaith service at the famous House of the Lord Church in Brooklyn that included speeches, dance routines, and performances from both a choir and the rock doc band N.E.D. The following day, the Globe-athon hosted a symposium at the United Nations focused on the eradication of cervical cancer that was attended by some of the leading doctors and awareness advocates in the world – all gathered in one place to discuss the obstacles they face in their counties and to share best practices. 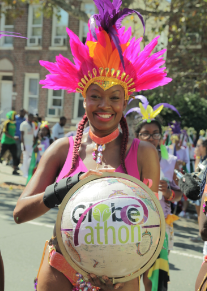 As a finale, the Globe-athon participated in the West Indian American Day Carnival Association (WIADCA) Parade on Labor Day – one of the largest events in the country that regularly brings 2 to 3 million people to Brooklyn every year. Following Globe-athon’s custom float, over a thousand dancers, survivors, doctors and medical students marched down Brooklyn’s Eastern Parkway, led by the Queen of Soca Alison Hinds.